The Richmond II has a thoughtful layout that maximizes all 1,574 square feet of living space. A recessed entry with a covered front porch leads to the welcoming foyer of this 3-bedroom, 2-bathroom home. An open staircase to the basement maintains that spacious feeling. The master suite features an expansive walk-in closet and spa-like oversized shower. 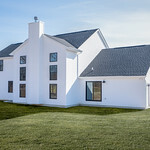 Designed to be a private retreat, there is a comfortable distance from the master suite to the other two bedrooms. The open-concept kitchen allows conversations to flow easily from the cook to guests or family relaxing in the great room. 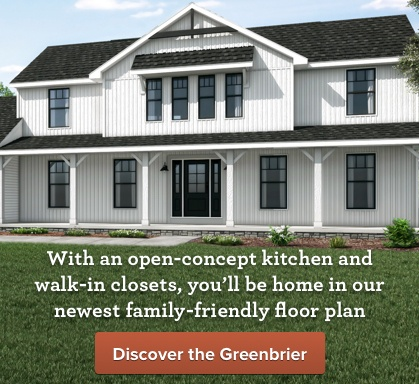 The Richmond II model home has an array of features that homeowners love. The exterior features the Craftsman elevation with Charter Oak Charcoal Smoke siding, shake siding, and board and batten siding. In this particular model, the third bedroom has been used to create a den. There are two and a half bathrooms, and the master bath showcases a large 60″ tile-look shower. 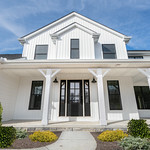 Featuring the Craftsman style trim package, the home has a cathedral ceiling in the great room with a faux beam, painted white with black brackets and a beautiful Craftsman style staircase in the foyer. There is luxury vinyl flooring throughout the foyer, kitchen and dinette areas. The kitchen also features contrasting white and stone gray Aristokraft Lillian purestyle cabinets for a high-impact look. With a 10×26 deck across the back of the great room and dining room and a partially finished basement with a bar and two office spaces, this home has so much to love. Ready to fall in love? 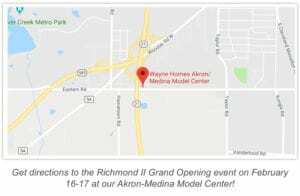 Join us on Saturday, February 16 from 10am-5pm and Sunday, February 17 from noon-5pm, for the reveal of the Richmond II model at the Akron-Medina Model Center. Bring your friends and family to take a tour, have some delicious snacks, and maybe win some fun prizes. The best part? 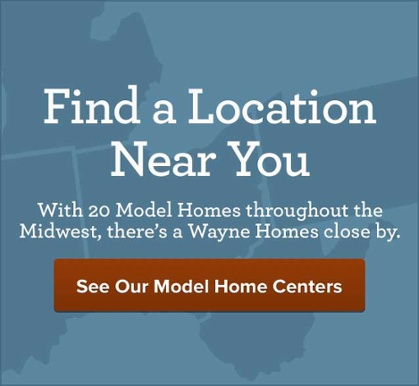 You’ll see how easy and rewarding it is to build a home, just like the Richmond II with Wayne Homes. Get directions and add this exciting Grand Opening event to your calendar. Can’t make it? Contact us for more information on the Richmond II or any of our custom floor plans.